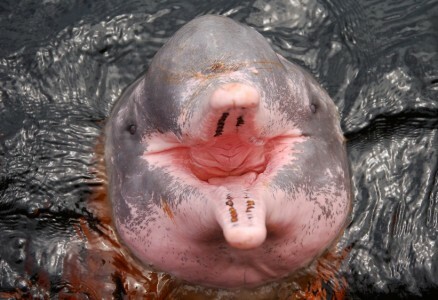 The Amazon River Dolphin flushes a brighter shade of pink when it is surprised or excited. Just like a human blushing! The Amazon River Dolphin is also known as the boto or pink river dolphin due to its distinctive colouring. It is one of only seven species of freshwater cetaceans. Amazon River Dolphins are only distantly related to saltwater dolphins. They have adapted to their surroundings with larger snouts with bristle hairs on the end, specially adapted for river-bottom feeding. Unlike their saltwater relatives, Amazon River Dolphins have a flexible neck and can move their head left and right due to unfused cervical vertebrae. The dolphins do not have a dorsal fin like other dolphin species, instead they have a long dorsal ridge. There are three subspecies of the Amazon River Dolphin present in different regions of South America. The I.g. Humboldtiana is in the Orinoco basin in Colombia and Venezuela, g. geoffrensis in the Amazon river system of Peru, Brazil and Ecuador and the I.g. boliviensis in Bolivia. The Amazon River Dolphin’s colouration is highly variable, affected by age and water clarity. Colours range from white/grey with a pink dorsal ridge and lighter below to a vivid pink! The sun’s rays make the dolphins lose their pink pigmentation so the darker the water, the more pink they will be. When they are excited or surprised, the dolphins will flush more pink, similar to blushing in people! Amazon River Dolphins are the only species of toothed whales to have different types of teeth in their jaw. Their back teeth are designed for crushing whereas their front teeth are pointy. The swollen part of a dolphin’s head, the equivalent of their forehead, is called a The blowhole is normally in the centre of the melon. Inside the melon, there are small air sacs which are used to make click vibrations. The melon focuses its ‘beam’ of clicks towards an object of interest, the sound then travels back providing the dolphin with information on the size, type and speed of the object. This technique is called echolocation and key for hunting prey. Boat engines and motors cause sound pollution which can distort the dolphin’s navigation system. An increase in river traffic threatens the Amazon River Dolphins as they are curious animals and some may approach boats where they can be easily injured by propellers. Amazon River Dolphins are the largest of the river dolphins, they can grow up to 8ft but are usually smaller. They can paddle forward with one flipper and backward with the other allowing them to manoeuvre more easily during river floods. The dolphins will travel into flooded areas of land; their flexibility allows them to dodge trees easily. Amazon River Dolphins are often seen swimming on their backs, this thought to be due to their ‘chubby cheeks’ which obstruct their downward vision. Dolphins are very intelligent animals; the Amazon River Dolphin’s brain capacity is 40% larger than humans! They are considered the most intelligent of the river dolphins. Amazon River Dolphins were spared from human persecution as it was thought they had special powers, however the dolphins are increasingly being viewed as unwanted competitors for fish. People will try and scare or kill the dolphins to prevent them taking fish. Except for humans, the Amazon River Dolphin does not have many predators, however, caiman, jaguars and anacondas have been known to catch dolphins on occasions! Mercury pollution is major problem for the Bolivian river dolphin from small-scale mining runoff. Catfish, a key food resource for the dolphins, are bottom-dwellers and are greatly affected by changes in mercury levels in water. Amazon River Dolphins are friendly and there are many stories among tribes in the Amazon of people being pushed ashore by dolphins when they were in the water!